Whether you are missing a single tooth or an entire mouthful, dental implants can offer a permanent solution to the gaps in your smile. Dental implants work by attaching artificial teeth directly to the jaw. 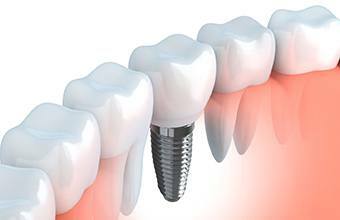 There are three components of an implant: the anchor, which will be surgically embedded into the bone, a post to which the tooth attaches, and the artificial tooth itself. Dental implants can replace one or more teeth, provide support for a partial denture, or be used to anchor a full denture. Keep reading to learn more about how Dr. Cher Rich can restore your smile using dental implants in Houston. Dental implants provide you with artificial teeth that look more natural than any other restorative treatment. Plus, many patients also report that whenever they chew, the implants feel secure just like their regular teeth. 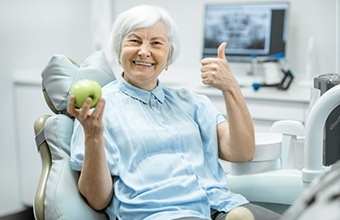 People who cannot successfully use conventional dentures or those who need an alternative to removable partial dentures can benefit from dental implants as well. This replacement is also the only solution that preserves the health and strength of your jawbone. When you lose teeth, you lose some of the stimulation that your teeth provided. Because dental implants are fused to your jaw, they provide the necessary stimulation to strengthen your bone. We use dental implants to replace one tooth, multiple teeth, or even a whole arch of your smile. You will need different restorations based on the number of teeth that you’re missing and where you’re missing them. If you’re missing a single tooth, Dr. Rich will use an implant-supported crown to restore the look and feel of your smile. This will seamlessly blend in with your natural teeth, and it will also maintain the health of your remaining ones. If you’re missing multiple teeth consecutively, Dr. Rich will recommend the use of a dental bridge. This restoration literally bridges the gap in your smile using dental implants on either side. This gives you a secure, functional, and natural-looking set of teeth. Are you missing all or most of your teeth? 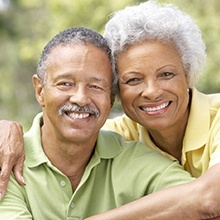 We can restore your smile with implant-retained dentures. Using some strategically placed dental implants, we can anchor your denture in place for the most secure bite. This restores your biting power, and best of all, confidence. There are many variables that can influence the cost of your dental implants. The number of implants that you need, location that you need them, and the condition of your oral health are just some of the factors that play a role in the price of your dental implants. There is also the cost of the restoration itself, which will vary depending on whether you’ll need a crown, bridge, or denture. The best way to receive a precise estimate is to visit our office for a consultation. Dr. Rich will carefully examine your mouth to make the best recommendation for you. If you are considering implants, a thorough evaluation by our expert dentist in Houston will help determine if you are a good candidate for them. This evaluation will include a clinical examination and a complete dental and medical history to gather information about any conditions you have that could interfere with normal healing (such as diabetes or heart disease). Also, be sure to tell Dr. Rich about any allergies you have or any medications you are taking. 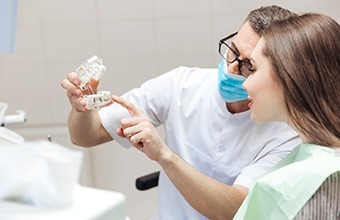 During the dental examination, Dr. Rich will check the condition of your mouth, the supporting bone in your jaw, and the way your upper and lower teeth fit together. They may gather additional information by taking x-rays and by making models of your teeth. With this information, they can determine if dental implants are the best way to replace your missing teeth. Hopefully, this answered a few of your key questions about dental implants. Dr. Cher Rich can offer you this fantastic solution right here in Houston, TX, so if you’d like to permanently close the gaps in your smile, be sure to contact us today.